Unorganised Chaos: THINKING: Thankful and Happy Thanksgiving! 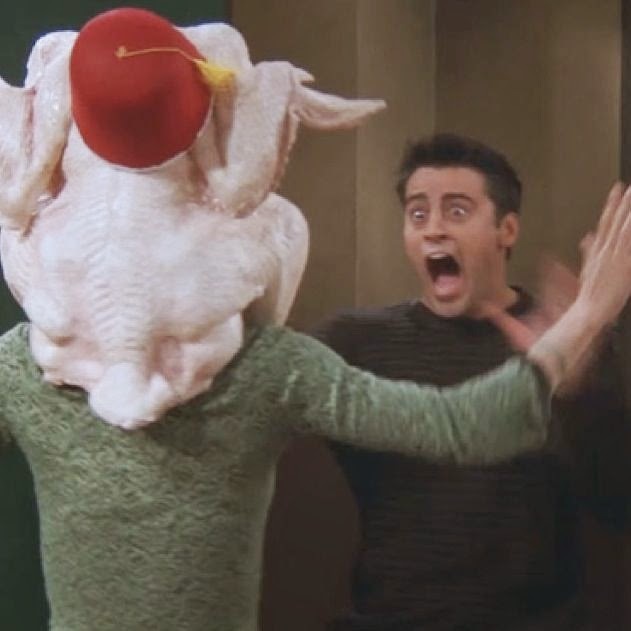 Does anybody else ALWAYS think of this whenever they think of Thanksgiving? Possibly my favourite Friends episode EVER. HAPPY THANKSGIVING TO ALL OF MY LOVELY READERS ACROSS THE POND! I love the idea of Thanksgiving and really wish we had something similar in the UK. As you know from some of my Let's Talk posts, I like to be reflective every now and then. I am a big believer in not forgetting the little things because, day to day, it's so hard to sometimes not focus on the bigger picture and remember that bigger picture is built up of so many smaller, important factors that we should appreciate and be thankful for. Last Thanksgiving I reflected on the things I was (and still am) thankful for - my parents, my grandparents, my friends, my degree, my health and the life experiences I had until that point. 1. Always feeling supported - I actually laughed writing this, thinking of various memes of bras and chocolate as support but seriously, I always feel supported by my parents and my grandma. They are incredible. Not only that the 'they're not family but they're my family' people - my Mum's best friend, my best friend and her family etc. I always feel like I have people cheering me on and having my best interests at heart. 2. This year as a whole - I really believe this year has been a massive turning point for me. I spent half of the year still travelling in Australia and New Zealand and it really opened my eyes, even more, to what's out there. The opportunities I had whilst travelling were incredible. Since coming home, I have learned even more about myself and the things I want. I feel I've grown as a person and know what I want. I'm not sure whether it's the fact I'm getting old (almost 24 makes me feel old!) or whether I just 'get myself' more now but I am grateful for 2014 and the things it has taught me. 3. New dietary products and nutritional help - I don't mean dietary as in diets of course but I have an intolerance to dairy and I have a sneaking suspicion I'm going to be mostly Gluten Free before this year ends. I feel like new products and increasing nutritional and dietary information are so much more accessible now and I couldn't be more pleased about this because it makes day to day life so much easier and so much more comfortable. I'm lucky that I've always enjoyed healthier options so that really has helped my transition to a healthier lifestyle but I am thrilled the GF, Dairy Free etc. options are more readily available. Point three feels a bit silly but you wouldn't believe what a difference it's making to my overall health and comfort. I still remain, and always will, eternally grateful for my Parents, my closest friends, my Grandparents and the things I spoke of last year. Spending half of my year away and the second half sorting my life out has made me really appreciate everything I have and the fantastic support network I've always had.